I recently fielded a question where the designer needed to extract the break lines which existed in the OpenRoads Terrain model. The designer could see them by toggling the display settings in properties but could not determine how to extract the break lines into separate and distinct graphical elements. 1. Open or create the DGN file which will contain extracted graphics. 2. Attach as reference the Terrain Model from which you wish to extract features. 3. Option 1. If you need the graphics from the entire Terrain Model, make a copy of the terrain. Just use the Microstation copy command. CAUTION: Make sure that you snap when copying so that you do not move the position of the copied terrain. See Option 2 below if you need only a portion of the terrain model. 5. Then select the copied terrain and turn on the visibility of the features you wish to make graphics. In this example, only the break lines and boundary are desired. 6. Finally, use Microstation’s drop command with Application Elements option checked ON to drop the terrain element to graphical elements. 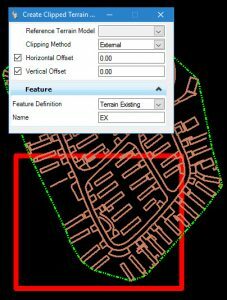 Option 2: If you only need features extracted from a portion of the terrain model, then instead of copy the terrain from the reference file use the Create Clipped Terrain command. 3.A. 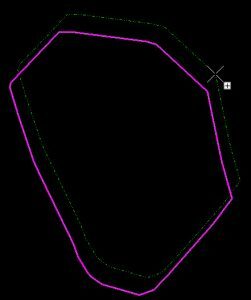 Make a shape which defines the area of interest. The clip terrain command only uses shapes and not fences. 3.B. 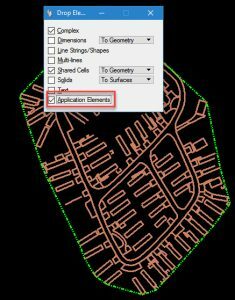 Then use the Create Clipped Terrain command, which will make a copy of the terrain model in the active DGN but only the area within the shape. 3.C. Return to step 5 above.